Dental veneers have long been used to create the ultimate smile makeover. With this treatment, it's possible to transform crooked, stained, damaged or badly worn teeth into a brand new, straight, white smile, as seen on many of the Hollywood greats. Veneers are wafer-thin lamintates or shells of tooth-coloured material (which can be either porcelain, ceramic or composite bonding material). They are cemented to the front surface of teeth to improve their cosmetic appearance. Many dentists use the analogy that dental veneers are for your teeth what false fingernails are for your hands. badly stained teeth that cannot be improved by teeth whitening or prophyflex treatments can be greatly improved by dental veneers, which function to cover any existing stains on your teeth. teeth that have become badly worn through excessive grinding or by carbonated drinks, as well as those that have been chipped or broken, can benefit from veneers. A small chip on a tooth can quickly be repaired with composite bonding, also knows as "composite veneers". A single damaged tooth can easily be repaired with a porcelain veneer that has the same characteristics and colour as you natural teeth. spaces or gaps (diastimas) between your teeth can easily be closed using dental veneers, giving you a more uniform-looking smile. Veneers are not the ideal treatment for crooked teeth, and from the point of view of preserving your natural teeth structure, orthodontics or Invisalign braces would probably a better solution. However, such treatments can take up to a year or longer. For teeth that are not severely crooked, veneers placed over their front surface will give a straight and perfectly aligned-looking smile. For this type of treatment, many people refer to veneers as "instant orthodontics", as you get a similar end result in a fraction of the time. Teeth veneers make teeth look natural and healthy, and because they are very thin and are held in place by a special strong bond (rather like super-glue) very little preparation of the tooth is needed. 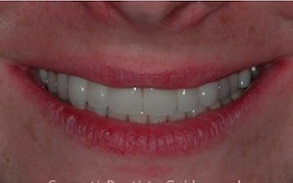 Teeth veneers can improve the colour, shape and position of teeth. A precise shade of porcelain can be chosen to give the right colour to improve a single discoloured or stained tooth or to lighten front teeth (usually the upper ones) generally. A veneer can make a chipped tooth look intact again. The porcelain covers the whole of the front of the tooth with a thicker section replacing the broken part. Veneers can also be used to close small gaps, when orthodontics (braces) are not suitable. If one tooth is slightly out of position, a veneer can sometimes be fitted to bring it into line with the others. 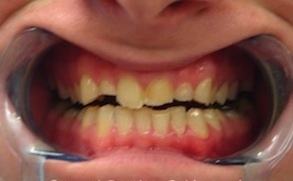 Will I need a temporary veneer between visits? Because the preparation of the tooth is so slight you will probably not need a temporary veneer. The tooth will look very much the same after preparation, but will feel slightly less smooth. What happens after the veneer is fitted? Only minor adjustments can be made to the tooth veneer after it is fitted. It is usually best to wait a little while to get used to it before any changes are made. Your dentist will probably want to check and polish it a week or so after it is fitted, and to make sure that you are happy with it. You can have teeth veneers on the NHS. However, many dentists prefer to provide cosmetic treatment privately. It is important to discuss cosmetic dentistry prices and treatment options with your dentist before starting treatment.